This movie is about young people and all about having very little money and extracurricular activities that are essential to a teaching principal called “The whole child.” One way to open the door is for kids is to come up with a program like a chess team. For kids, chess is more than a game – it is where they can transcend from reality and become kings and queens themselves. Learning Chess makes dreams come true for children that don’t have a lot of money. They are determined to master the world’s most difficult game. If they can manage that – imagine what other mountains they can climb. The movie is Directed and produced by Katie Dellamaggiore in her feature film directorial debut. It’s a little monotonous – but the documentary keeps you in your seat. Opens November 16, 2012 in San Francisco at Landmark’s Opera Plaza. This stage play is about unlikely friends. They are two Chefs, who are chasing and pursuing different careers and philosophies. It sure gets a little crowded sharing one stage with these excited guys. But, it’s a great time for all. You’ll love Anthony Bourdain and his good friend Eric Ripert (internationally renowned chefs). They may, or may not love each other. They call it the “Good vs. Evil Tour.” Their one night only in San Francisco, will brighten the Orpheum Theatre with hilarious storytelling. We get to see provocative insights about what goes on behind kitchen doors. You’ll really enjoy the intrigue and delight. Tix go on sale to the general public on Friday, Nov. 16 at 10:00am. Check it out by phone at 888-746-1700, online at shnsf.com, or of course, get your tix in person at the Orpheum Theatre Box Office. More info: https/www.shnsf.com/online/bourdain. He bursts onto the Venetian Room stage in the Gorgeous Fairmont Hotel. There he is, in a hot Red Suit. He grins at the audience and sez: “I’m leaving Texas!” Tune knows all the great music. God knows he sang most of them around the world. Tune asked his friend Carol Burnett one day, how she became a big star. She said: “I had to become a star – I wasn’t good enough for the Chorus!” Tune is 6’foot 8 – and when he climbs a ladder (which he did on the stage) it made him look like a giant. In the audience was Star Carol Channing – and that gave even more excitement to the night. Imagine – two famous people close enough for you to touch. One woman was enjoying the evening sitting in her chair as she knitted a sweater and listened to the tap dancing, which is famously fantastic. I’ve never been able to knit and watch a show. But Tune did say: “Phyllis Diller could drink me under the table.” The evening music was magical. 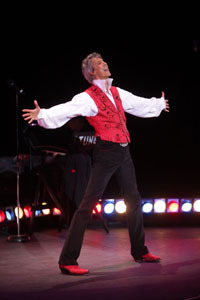 I especially liked his brilliant taps and this lyric: – “Every time I Die a Little!” Yep – Tommy Tune is a Smart, wise talent that can Dance, Tap, Act – and his singing will blow you away. It was a glittering evening. There is a small Theatre in the downtown Theatre district where you can see and hear some very interesting and memorable songs written by the following Composer/Lyricists: They are: Peter Alexander, Billie Cox, Paul Frantz, Richard Jennings, Sandy Kasten and Bill Johnson, Allison Lovejoy, Michael Lunsford and Peter Master. This is an irresistible from its first minutes – perfectly cast and entertaining in every way. See it with other people! See it with a Crowd! The Alcove Theatre is on the 3rd floor on Mason Street.